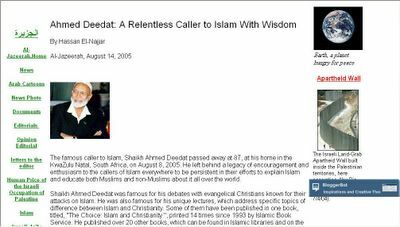 Ahmed Deedat, one of the most leading authority of comparative religion. He contributed great on research on Christianity and Islam. His research on Christ, his actual life story is really inspiring. Ahmed Deedat passed away on 8th August, 2005. Surely we are from Allah, and to Him is our return. May Allah grant Ahmed Deedat paradise.